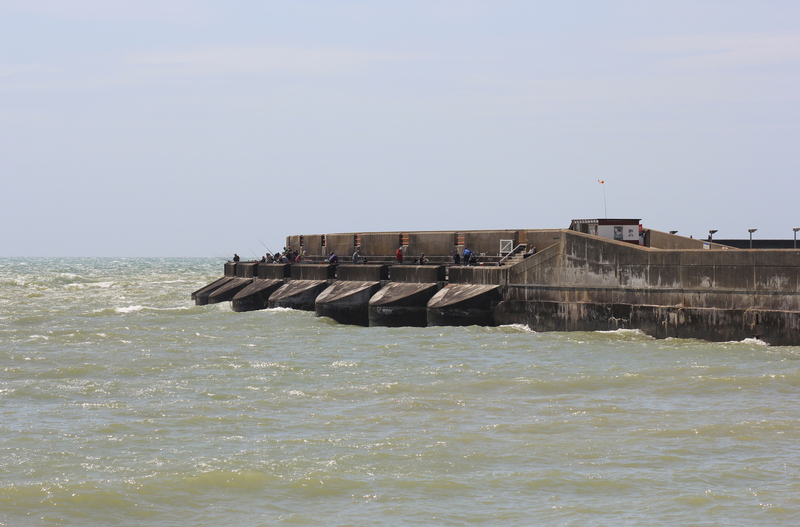 The Undercliff Walk took us all the way to the eastern arm of Brighton Marina. The Marina is huge. Occupying almost half a square kilometre and boasting 1,600 berths as well as an entire village, it is the largest marina complex in Europe. As we approached the eastern arm we looked at it and enjoyed its strange, buttressed, shape. Fishermen tried their luck from the lower, outer, walkway. We walked up and started our way along it. The eastern arm is approximately three quarters of a mile long. 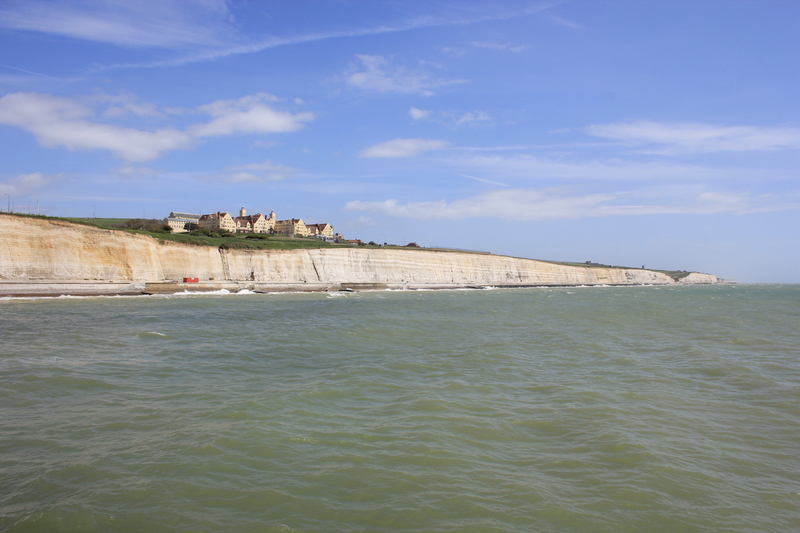 We looked back at the Undercliff Walk at it stretched away behind us. Roedean School sat on top of the cliffs looking out to sea. What an amazing location for a school! We turned around and continued walking along the marina arm, but all of a sudden something caught my attention. “Quick!” I hissed at the others with a touch of hysterical incredulity in my voice. “Come here – someone’s just caught a fish!”. “It’s a momentous occasion for us,” I explained. “We’ve walked 400 miles around the entire coast from Southend. We’ve seen thousands of people fishing, but we’ve never seen anyone actually catch a fish. I was beginning to think it was all a myth or some great conspiracy”. He laughed and looked at me as if I had received the benefit of too much sun today. If you take a moment to think about the maths, you will realise how significant an event this was. We had walked over 400 miles before seeing anyone catch a fish off the coast of Britain. 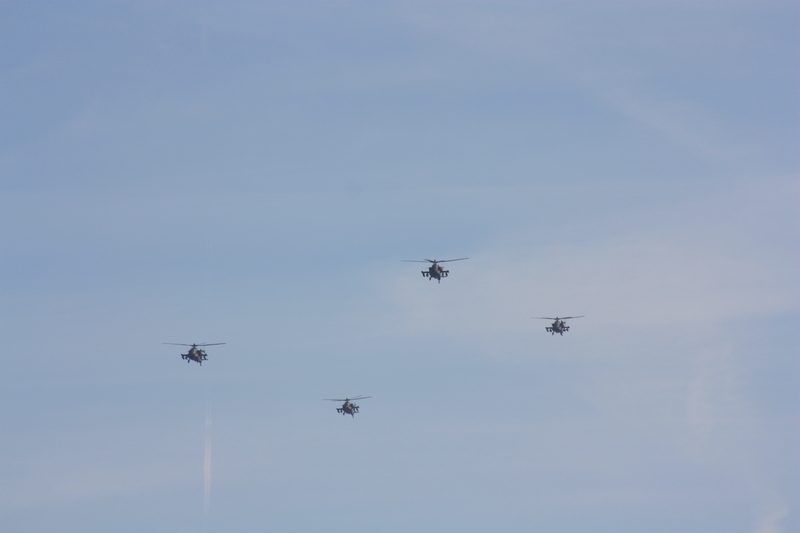 Based on other things we had seen on our walks, until this point we were statistically more likely to see a formation of Apache attack helicopters flying directly over us; a Spitfire; a golden eagle; and a naked stranger (links are attached to each of these, save for the last. I thought taking a picture of a naked stranger was not such a good idea). 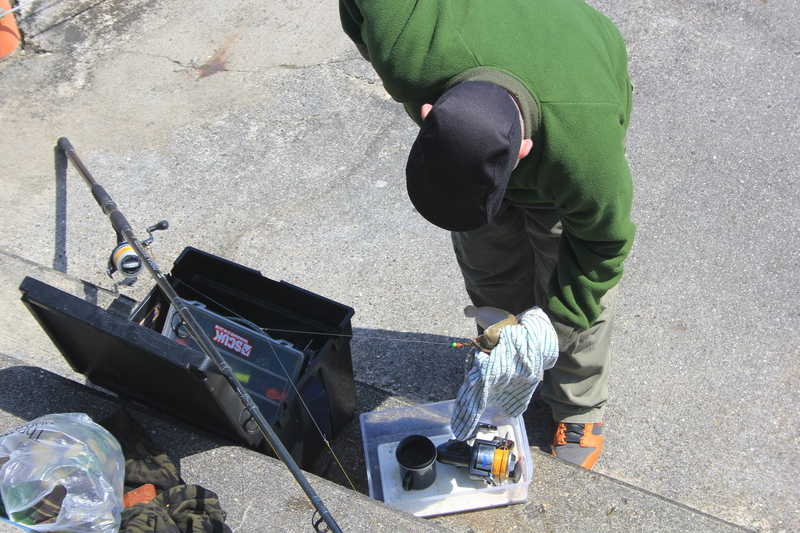 So you see, seeing a man catch a fish after 400 miles of coastal walking is something to be celebrated. The lucky fish was thrown back to the sea. I was happy that this imbalance had been addressed. The statistical equilibrium was on a level again. Things were as they should be. 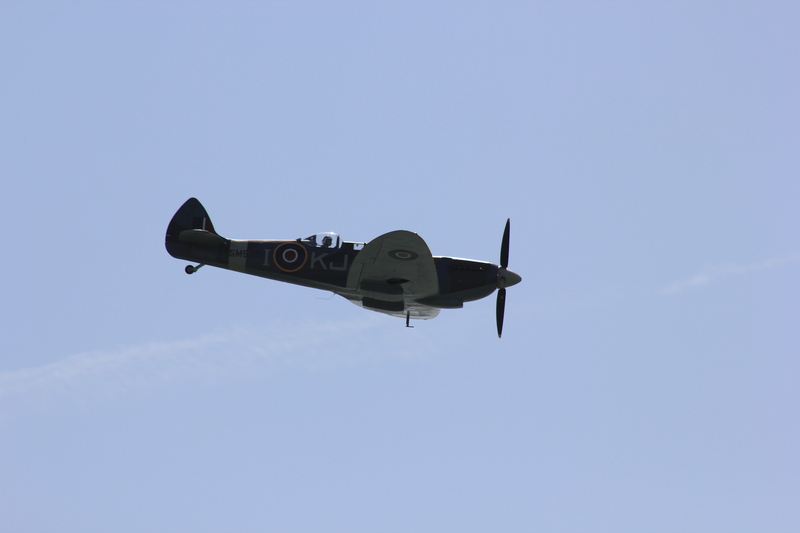 Unfortunately, about five minutes later as a Spitfire raced by about 200 feet away from us. There you have it. If you walk the coast of Britain you are more likely to see a Spitfire than you are a fish being caught. Who would have thought? This entry was posted in East Sussex and tagged brighton, coast, East Sussex, fish, fisherman, fishing, roedean school, Spitfire, travel, walking. Bookmark the permalink. In general i am with you on the number of fish caught per 100 miles covered, the two exceptions i remember was on the Devon coast (man had 4 mackerel on one line of feathers), and opposite Liverpool those men had it sussed hauling in flat fish and cod.